If you’ve ever had to use a computer at school or work since the dawn of the internet, you’re probably had the joy of trying to kill time whilst navigating around a stringent firewall. Everyone I knew would kill class time by playing Flash games, but my school was at the ready to block any site that gained any amount of popularity. Unable to play the infamous time-wasters like Line Rider I had to dig into more niche titles, which eventually lead me to the black-and-white sidescroller Shift. The game and its sequels were favorites of mine, but nowadays Flash is long dead, and I’d totally forgot these games existed. Enter Shift Quantum, a spiritual successor that continues in the footsteps of the original puzzle platformers. Thankfully this isn’t a lame nostalgia trip for internet procrastinators like me, but a spinoff miles ahead of the originals that works whether or not you know the source material. Shifting expectations – The game’s main mechanic is the titular shift. 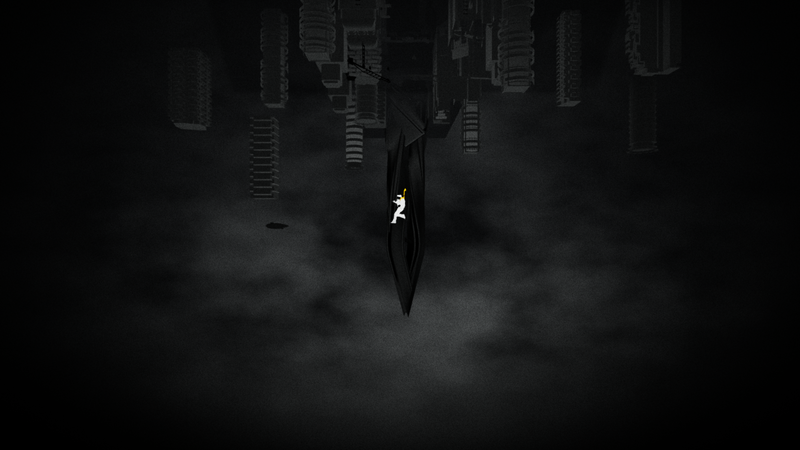 You begin every level as a black silhouette walking on a black floor against a white background. You can run and jump like any sidescroller, but that’s rarely enough to reach the exit. That’s where shifting comes in; so long as you’re standing on solid ground, pressing the right trigger will turn the world upside down. Your character is reflected through the floor, changing you to a white silhouette on a black background, and the white tiles that were previously the background are now solid floors and walls. You may see a tall wall blocking your way, but shift through the floor, and it becomes a deep, narrow hole that’s easy to jump over. This all may sound confusing, but trust me – it makes more sense in practice than it does on paper. This mechanic is the crux of every puzzle in the game, and before long becomes more second nature than jumping. Shift work – The main campaign features over 100 levels, and is a shining example of having both quantity and quality. It starts off simple with a few basic platforming challenges to get your head around the core mechanic, but is constantly building from there. Soon there will be objects you can’t shift through, boxes that only exist in one plane, gravity shifts… it just never stops, and the ideas just get more clever and game-changing as you go. These new ideas compound on each other to create complex and elaborate brainteasers that fit into perfectly digestible chunks. Levels may look small but are crafted to testing your ingenuity and ability to work from multiple perspectives. The game can get pretty mentally challenging, but once you get that “a-ha” moment actually completing the task won’t be terribly demanding. New mechanics are added in without explicit tutorial, presented naturally enough so that you’re never in the dark about how something works. Level design is absolutely brilliant, and the key reason shifting feels so unique and rewarding. Overtime – If the campaign isn’t enough for you, there are infinitely more levels available through the level editor. Building levels is incredibly intuitive, with well laid-out menus and a grid-based level system that makes putting everything together a cinch. Finished and tested creations can be shared with the community online. From the community tab you’ll also be able to play other’s creations, and with filters from size to difficulty it is easy to find something exactly to your taste. Story time – A game like this never was going to have a story that made any logical sense, but the game tries anyway. Introduced through some extremely cliché corporate exposition, the game presents a future where a corporation is trying to sell happiness through some sort of cerebral techno-therapy called the Shift Quantum program. 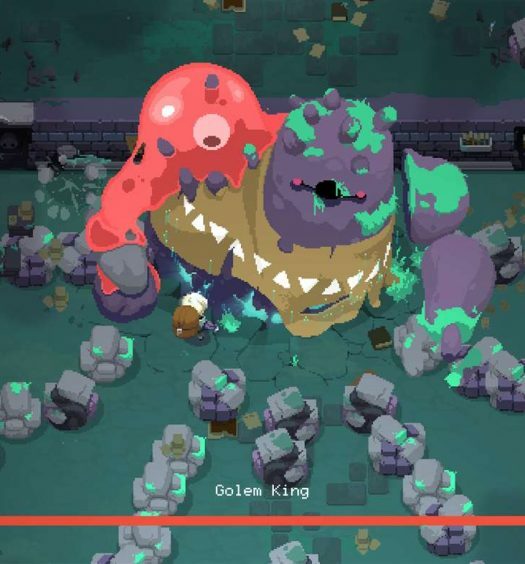 It feels like the game is trying to justify why the gameplay is what it is, but it’s trying too hard. The game proper is less in-your-face about its story, lacking dialogue and relegated to small events that pop up in some levels. This method of storytelling works much better; it’s understated, unobtrusive and open to interpretation. What am I looking at? – For a game that could have easily skated by with a minimalist approach a la N++, it’s art direction is baffling. 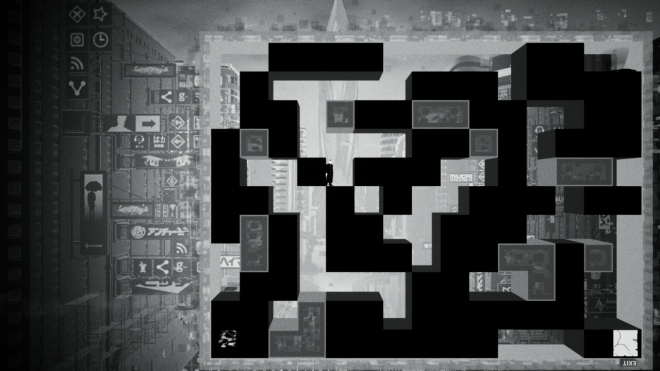 Every level is set on a grayscale backdrop of a lively futuristic city. It looks fine on its own but is so inconsequential to gameplay or story that it’ll soon become ignored visual noise. The play area is suspended above this city inside an ethereal box surrounded by hazy walls, appearing as if the game was haphazardly projected onto a completely different game. 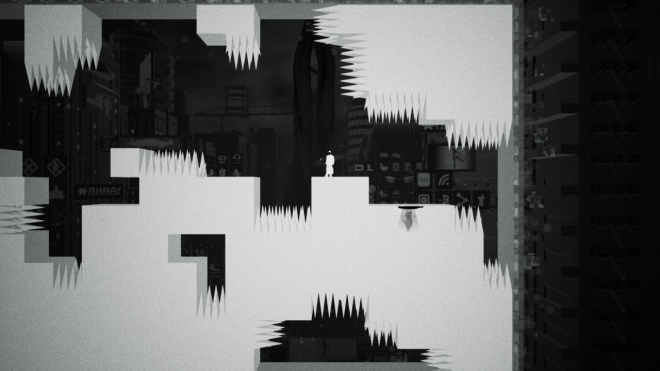 The screen is a mess, but at least a great use of grayscale makes the level stand out from everything else. ctrl+shift+I – If this game has one design issue, it’s that the reset button is on the start menu and comes complete with an “are you sure?” prompt. Trapping yourself in a level is a real risk, especially later in the game. Not having a quicker way to reset feels like an oversight, especially when half of the controller’s buttons are assigned to the one shift ability. If the game has one technical issue, it’s that you can randomly fall through the world. The first time this happened I legitimately thought it was an intentional surprise twist; the level just blinked out of existence, and I fell through the void while the background did some crazy transitions. This rarely happened, seemingly due in part to a wind tunnel mechanic added around the game’s midpoint, but if you can get it to happen once you are reliably able to pull it off in the same spot again. Shift Quantum is a fantastic little puzzler that goes for broke creating unique spins on its core mechanic. It’s stumped me on more than one occasion, but its quick levels and pick-up-and-play nature made it easy to put down and try again when my brain was ready for the challenge. It’s too bad the packaging is mediocre, and there are some small but glaring oversights, but those issues aren’t aggressive enough to ruin the core experience if this is your type of game. Gameplay may be the only aspect that truly succeeds, but that’s all you really need in a game like this. Shift Quantum was developed by Fishing Cactus and published by Red Panda Interactive. It was released May 29, 2018, for $19.99. A copy was provided for review purposes.